The effects that adrenaline has on our body are well-known. An adrenaline rush makes you focused but at the same time more alert. It enhances your concentration, it helps you utilize all your brain’s CPU and make split-second decisions while under its influence. 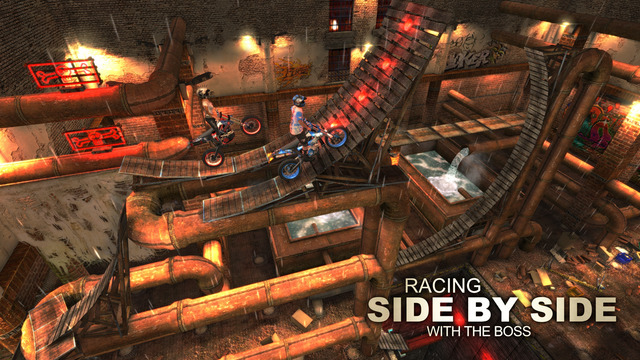 Well, we believe that Rock(s) Rider: HD Edition [$2.99] by ECA-Games aims to do just that. Don’t let the name fool you. Although you might think “motorbikes or racing games are just not my style” we assure you that this game is more than that. We believe that Rock(s) Rider HD Edition was designed having in mind a wide audience and it should appeal to everyone, whether you like peaceful thought-provoking challenges or fast-paced action. How is that possible you might ask? Well let’s take things from the beginning. First of all, the visuals of the game are simply striking. The graphics and details of the surroundings remind us that video-games are a growing art form. You cannot but appreciate the rugged charm of the warehouse settings and the overall mechanics of the game. ECA-Games have put a lot of effort in making every bit of the visual environment look as an indispensable part of the game; adding more to the whole quality of the design. Admittedly, Rock(s) Rider: HD Edition makes its creators proud and able to proclaim console quality visuals on the mobile platform. Although Rock(s) Rider: HD Edition brings nothing new in this game category of motorbike stunts, it certainly creates a new level of quality. The complexity of the stunts and the sudden changes in the direction, speed, and difficulty of controlling your bike really makes the imagination and hard work of the developers shine through. ECA- Games have managed to refine a type of game that we take for granted and to be reconsidered as one of the most exciting and fun games we have ever played. As you imagine, a motorbike game such as this will carry little to no background story. However, none of that will matter when you ride that bike for your life. You will be chased spreading wildfire; suddenly find yourself being lifted in the air then falling in the empty space; and being suspended in mid-air not knowing what lies ahead or where you are going to land really makes you hold your breath for those few seconds. Don’t get us wrong, of course there will be times when you will want to smash your iDevice on the wall but for us, this is what makes this game even more engaging. Making the impossible happen even if you need to restart the game numerous times. Rock(s) Rider: HD Edition consists of 64 different levels each with its own level of difficulty, complexity, and even puzzle solving characteristics. 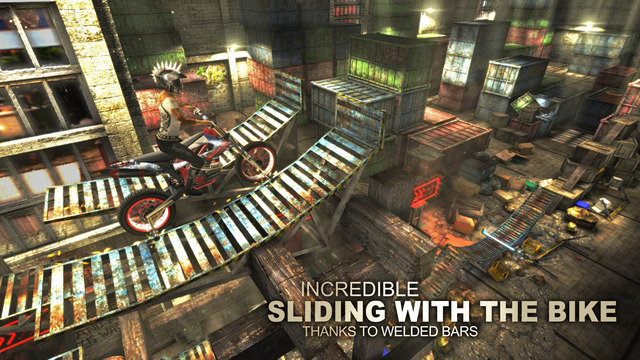 You will experience the rustic charisma of 5 different very life-like and stunning underground and warehouse environments packed with hidden traps, obstacles, and infested with objects that are purposely put there to interact with your bike and enhance the realistic expectations of the game. You can get a higher score by completing the objectives of the game and with 150 different kinds of challenges, this game guarantees that you will never find it monotonous! Nevertheless, based on the quality of the game and the effort from the developers, the price tag seems rather fair. For its revolutionary concept, addictive challenges, detailed surroundings, and explosive environments; Rock(s) Rider: HD Edition comes across as the brain-child of a cutting-edge mindset. Something that struck us as bizarre however, is the fact that in-app purchases and add-ons like the Safety Cage and Nitro Oxide, cost $1 more than the game itself. In all fairness, these add-ons are not essential or necessary in completing the game. They are simply there should you wish some extra help to overcome the obstacles and some difficult levels. Considering this, we actually appreciate that ECA-Games have made these add-ons optional without depending on them to progress in the game. Rock(s) Rider: HD Edition was released on the 3rd of September for iOS so if you have not heard of this game yet, now you have. You can check the trailer for this game below.